Recognized neither as Cambodian nor as Vietnamese, thousands have lived with neither home nor identification for generations. Ba Tai stopped by a wet market near the Tonle Sap River and the lake of the same name in Cambodia to buy some tobacco, rice, salt and incense sticks. Then he walked to a nearby cemetery to visit his parents’ and grandparents’ graves. In family stories that Tai has been told, his ancestors came from Dong Thap Province in southern Vietnam. His family is one of thousands who belong to an ethnic Vietnamese community that has lived on hundreds of floating villages on the Tonle Sap. Tai used to think that he would end up at this cemetery with the rest of his family one day, but that is unlikely to happen. After the cemetery visit on an afternoon in August 2018, he returned to his boat, where his wife helped him hang a small plastic bag containing rice, salt and a small bundle of wood on its bow, a long-standing ritual among the Vietnamese Cambodians, a prayer that the ancestors will watch their steps and bless them with peace on long journeys. Together, the four boats that were home to Tai and his big family, including children and grandchildren, left the pier. That was their last day in Cambodia, where they were born, grew up and lived all of their lives. Since that day, Tai and his family, for long bereft of a national identity, have no idea where they belong. Tai and his three grandchildren on his boat. Tai took his family "back to Vietnam," a place he has no connection with, except his ancestry. And like Tai, tens of thousands of other ethnic Vietnamese have left and will leave Cambodia, unable to prove that they are official citizens. Between the late 19th century and early 20th century, the French sent thousands of Vietnamese to Cambodia to work on their rubber farms and through the years, a Vietnamese community took root in the new land. This community became a genocidal target under the Khmer Republic and Khmer Rouge governments in the 1970s. Thousands were killed and many more sought refuge in Vietnam. The Khmer Rouge, under the leadership of Pol Pot, general secretary of the Communist Party of Kampuchea, Cambodia's former ruling party, invaded Vietnam and killed tens of thousands of Vietnamese between 1975 and 1979. On the plea of Cambodian revolutionaries, Vietnamese soldiers entered Cambodia in January 1979, launched a retaliatory attack on the Khmer Rouge and succeeded in freeing Phnom Penh and large parts of Cambodia from their grasp. After the war ended, the ethnic Vietnamese returned to Tonle Sap, where their parents, grandparents and they were born, only to discover that they had been labeled as "illegal immigrants." As the Cambodian law only allows Cambodia citizens to buy land, thousands of ethnic Vietnamese settled in villages on stilts. After the pioneers, two more generations of Vietnamese Cambodians have been born in Cambodia, living with no official documentation of their existence. According to the Cambodian Overseas Vietnamese Association, over 1,500 Vietnamese families live in floating villages by Lake Tonle Sap, the largest freshwater body in Southeast Asia that used to boast one of the most fertile ecosystems in the world and provided 75 percent of Cambodia's freshwater fish catches. Since 2017, the Cambodian government has been making plans to relocate this community as part of a master plan to beautify the riverfront and improve water quality. At a meeting last November, Cambodian Deputy Prime Minister and Foreign Minister Prak Sokhonn and Vietnamese Deputy Prime Minister Pham Binh Minh agreed to work together to relocate the floating families in the Tonle Sap area. In February last year, Cambodia’s Ministry of Interior pledged to issue a residency green card to roughly 70,000 ethnic Vietnamese people. Immigration chief Sok Phal told the PhomPenh Post that the system would be similar to the green cards given to immigrants in countries like the U.S. or Canada. However, a New York Times report says Cambodian officials have demanded that residents either volunteer to move to Vietnam, or pay a biannual fee for an immigration card identifying the holder as Vietnamese. With no formal legal identity and few of the rights enjoyed by their Khmer and Cham neighbors, ethnic Vietnamese people say they have had to pay large bribes to the fisheries police, the environmental police, the maritime police and other authorities. They are frequently subject to evictions, mobs and capricious imprisonment, the NYT report said. It is regulated by Cambodian police that each fishing boat belonging to ethnic Vietnamese on the Tonle Sap Lake has to pay a VND20 million ($860) fee every fishing season. "And as we have no legal papers, it’s always been hard for us to go fishing without being harassed by local authorities. In recent years, they have either showed up to seize our nets or fine us, and we are not protected by law when our nets are stolen," he said. Faced with this oppressive situation, many of ethnic Vietnamese families decided to move to Vietnam, hoping that the land of their origins will help them. They did not know that leaving Tonle Sap will not change their state of statelessness. A community of Vietnamese Cambodians in Vinh Hung District, Long An Province. Along with Ba Tai, 30 Vietnamese Cambodian families sailed to southern Vietnam and resettled in Tuyen Binh Commune in Vinh Hung District of Long An Province, two kilometers (7.5 miles) from the Vietnam-Cambodia border. They built huts on a 500 square meter area along a waterway and began paying rent to locals. 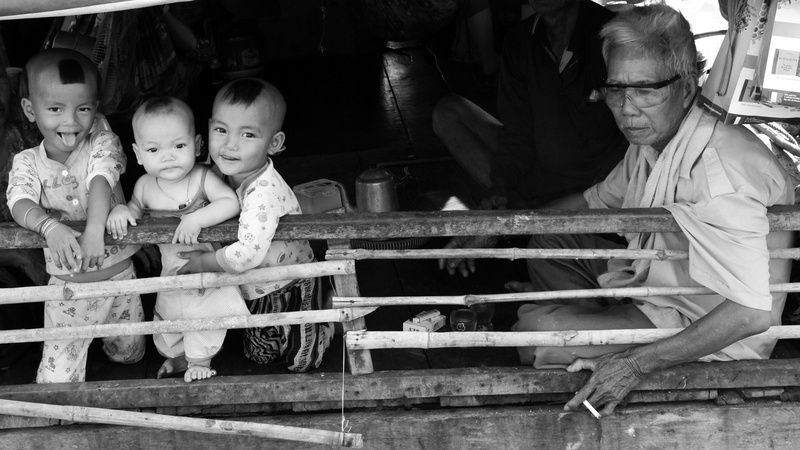 But their new life has been tough, even tougher than the old one in the floating villages on Tonle Sap. Tai, his wife, son, daughter-in-law and three grandchildren share a space that is just a little more than 10 square meters. Inside the hut, they have to hang hammocks so that everybody gets space to lie down. Back in Cambodia, Tien, Tai’s wife, did not have to worry much about their daily meals. The only thing that Tonle Sap folks needed to buy was meat. They had an abundant source of fish and vegetables around, and wood was easily found in nearby jungles. 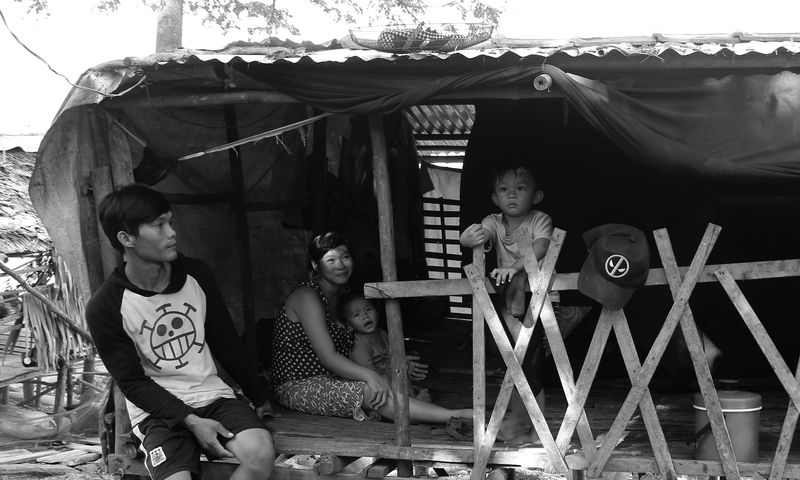 Since moving to Vietnam, Tien and her children have had to tighten their daily budget. They normally skip lunch to save food for days when they are unable to catch any fish. In the area where Tai’s family settled down in Long An, the waterways are badly polluted and there is no future in fishing or aquaculture. During the flooding season last year, Tai and his son would leave early in the afternoon to fish in several tributaries of the Mekong River and return close to midnight. They did this so that the women at home could take the fish to the market and sell it first thing in the morning. But there were several nights that the father and son returned empty handed. "My parents communicate in both Vietnamese and Cambodian, and I can’t tell if I’m Vietnamese or Cambodian," Phiep, Tai's neighbor, said in Vietnamese. Her memory, which has been affected by heavy alcohol use, tells Phiep that she grew up on a floating village on the Tonle Sap Lake. She lived all her life in that village, saw her parents pass away, got married and had her own family. After her husband passed away, Phiep took her daughter, son-in-law and four grandchildren, and followed a group of Vietnamese Cambodians to Tuyen Binh Commune. Every day, Phiep stays home to look after her youngest grandchild when her son-in-law goes fishing and her daughter and grandchildren go into town to sell lottery tickets. Life is sad, Phiep says, so she spends a small sum on wine every day to forget that sadness and also her muscle pain. Sometimes, some benefactors call on them, but people like Tai and Phiep are steeped in poverty. What they actually need is a legal citizenship and a national identity card so that they can get a job and their children and grandchildren can go to school. Around 100 meters from where Tai’s family stays in Hung Ha Commune of Tan Hung District is another community of Vietnamese Cambodians with a dozen families or so. In the flickering light from a battery, Phuong’s family was preparing dinner with some fish he’d caught in the afternoon. 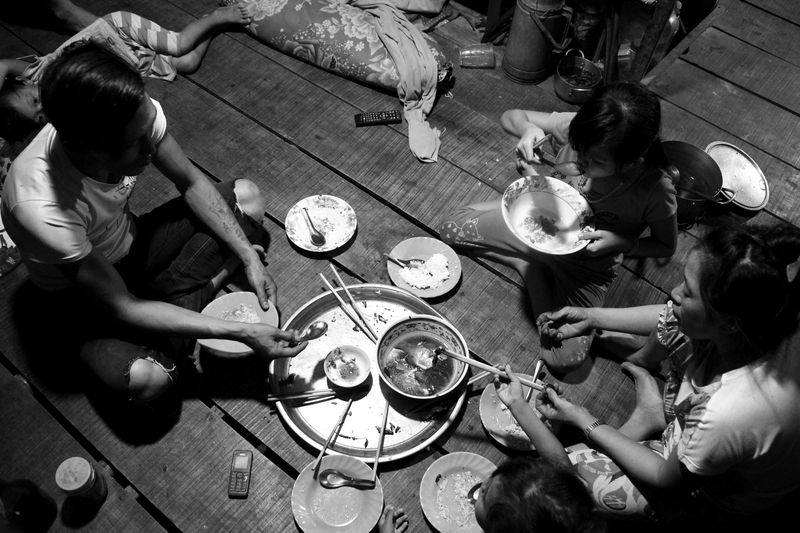 That evening, Phuong, 33, had dinner with rice and broth from the fish soup so that his three kids could have the fish. Phuong's family has dinner with rice and fish soup in Tan Hung District, Long An Province. In his neighborhood, men like Phuong can only find jobs as porters at a nearby rice milling plant and earn no more than VND200,000 ($9) each day, but this is just a seasonal job and there are days they have no work. The women and children either collect water hyacinths and dry the plant for sale (as the weed can be used to make baskets or bags), or go into town to sell lottery tickets. "Of course it’s sad and sometimes I want to go and find a job in Saigon (the nation’s biggest city that borders Long An) or Binh Duong (the industrial hub that neighbors Saigon) so that my kids can have a better life, but who would hire me when I don't have any legal papers?" Phuong said. The young man is an example of what happens to Vietnamese Cambodians when they have no legal ID. In 2018, Doi went to Saigon and asked for a job at a construction site. He accepted an offer of VND3.5-4.5 million ($150-194) per month. He shared a rented room with other workers and sometimes, when the local police ran a check on temporary residence papers, Doi had to hide himself. But his difficulties do not stop there. The contractor did not pay him, after finding all excuses to delay it. So he quit, struggling in the city for sometime before moving to another construction site. The new employer also failed to pay him his monthly salary of VND4.5 million ($195). He finally had to call his brothers to travel all the way to Saigon to pick him up, because he did not have money to buy a bus ticket. "They know I have no paper, and I cannot sign contracts with them. So it is obvious that there is no way I can sue them if they do not pay me," Doi said. So far, 20 young Vietnamese Cambodian men in his neighborhood have had similar experiences. 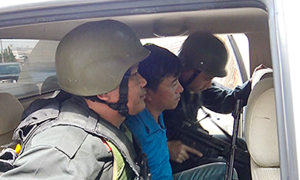 Despite such suffering, authorities in Long An have failed to find any solutions. A couple of years ago, commune level authorities in the province identified this community as "Viet Kieu," or overseas Vietnamese, but now, they call them "free migrants" because it is almost impossible to prove their Vietnamese roots. In July last year, Vietnamese Prime Minister Nguyen Xuan Phuc assigned social-affairs authorities and authorities of provinces that share the border with Cambodia to pay more attention to Vietnamese Cambodians returning from Tonle Sap, especially on the issue of birth certificates and education. But local authorities have done nothing to help, so far. 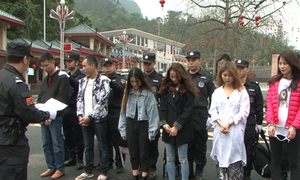 "The biggest problem now is that the current regulation requires that a person should prove that he or she has lived for at least 20 years in Vietnam to earn citizenship," said Huynh Thanh Duoc, vice chairman of Tuyen Binh Commune in Vinh Hung District. Nguyen Thi Phuong Lan, vice chairman of Hung Ha Commune in Tan Hung District, said the commune is now home to more than 70 Vietnamese Cambodian families with nearly 300 members, but only a dozen families have got legal papers. These are families that can still identify where their forefathers came from and authorities in those places are able to track down their roots. "Apart from the minimum time of living in Vietnam for 20 years, Vietnamese Cambodians must prove they have roots in Vietnam to get the citizenship," Lan said. At this point, the local authorities can only help by letting them borrow or hire land. Recently, Tuyen Binh Commune began giving birth certificates for babies born to those families, so that they can go to school. Hung Ha has issued a temporary residence book to each family in the commune. However, this book only helps authorities manage the families better, rather than helping people like Doi find a job away from home. The first Vietnamese Cambodians returned to Vinh Hung District in 1993, and for more than two decades, they have been waiting for that one ID card, and their children have not been able to attend school. These days in Tuyen Binh Commune, some border guards have volunteered to work as teachers in their free time to teach Vietnamese Cambodian children read and write. "Our classes can only go as far as helping them to read and write and do basic math, we cannot follow the secondary and high-school programs," said senior lieutenant Dao Dinh Luyen. But it is not easy for the border guards to have kids attend these classes. Luyen had to spend time encouraging each family and look for free books to give the kids. Most of the kids are more interested in selling lottery tickets than studying because they can earn money right away. 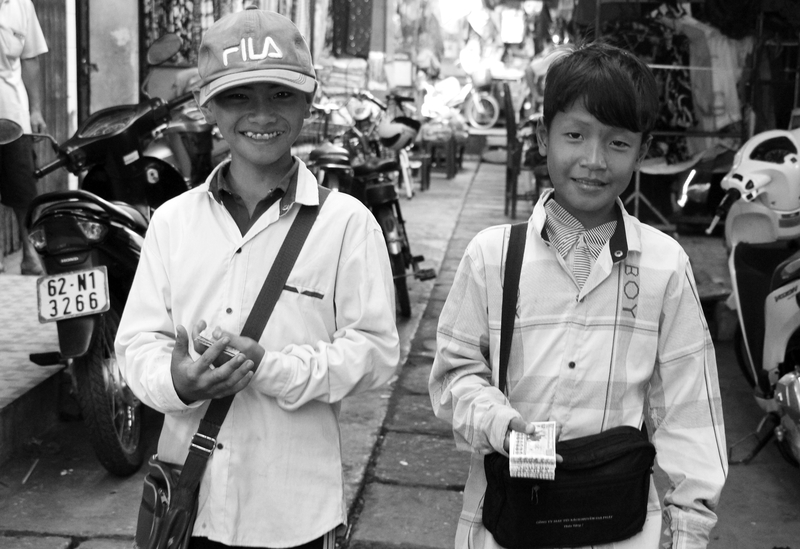 Two Vietnamese Cambodian boys sell lottery tickets in Tan Hung Town of Tan Hung District in Long An Province. One afternoon, 30 minutes after one such charity class had started, Nguyen Thi Kim Ly rushed in. As she looked for a seat, she wiped the sweat on her forehead and face. She had just returned from town after selling lottery tickets. At 13, Ly should be in secondary school, but she follows a program for the third grade. Ly has been in Vietnam for more than five years. Her father is a construction worker while she, her mother and 10-year-old sister go to town every day to sell lottery tickets. There are families that do not stick to one place but travel back and forth between Vietnam and Cambodia to catch up with both the fishing season in Tonle Sap and the rice harvesting season in Long An. "Children of these families are the most disadvantaged as they have to live a nomadic life and cannot follow our classes," said Luyen. Ly lives such a life. Luyen said Ly was a hard-working, bright student but there was not much hope for her, the fourth generation of Vietnamese Cambodians. He said he was afraid that her future will follow the same path as that of her parents. "I really don’t know where my actual home is, here in Long An or somewhere in Tonle Sap," she said. 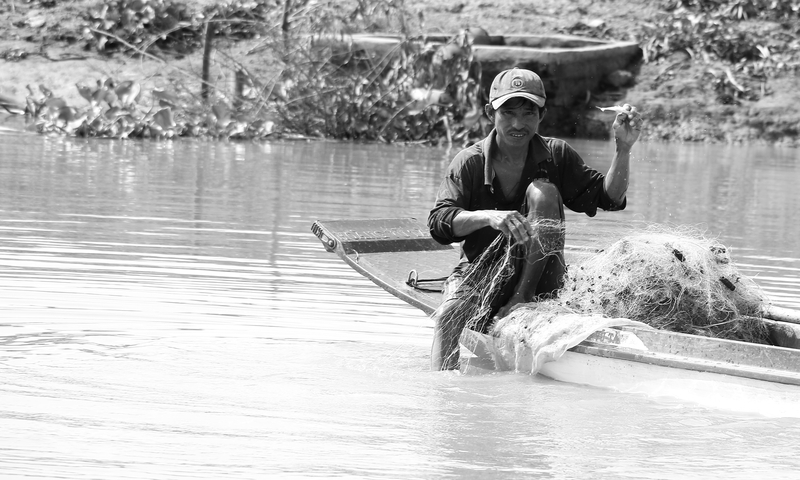 A Vietnamese Cambodian man goes fishing in Long An Province. In January this year, Cambodia decided to postpone the resettlement of Vietnamese people after considering the impact it would have on the livelihoods of the community there. "We constantly think about the people’s livelihoods. In this case, they have been doing cage fish farming. So if we move the cages on to land, the fish will die. So we let them keep their homes and cage fish farms temporarily," Kampong Chhnang provincial governor Chhour Chandoeun said in a statement. "They need to settle on land. They can keep their cage fish farms but can’t live in the area permanently." 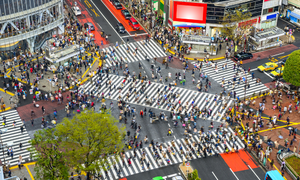 He added that authorities are preparing for the relocation within the next six months. The relocation will be done in two phases, according to provincial deputy governor Sun Sovannarith. In the first phase, the government will build the required infrastructure for families already relocated and those who do not make a living from fish cages. In the resettlement areas, local authorities and NGOs will build roads, schools, health centers, and water and power supply systems, according to the plan. In the second phase, authorities will work with private companies to turn fish farms into tourist attractions. For now, a life of misery and deprivation is the reality for most undocumented immigrants. 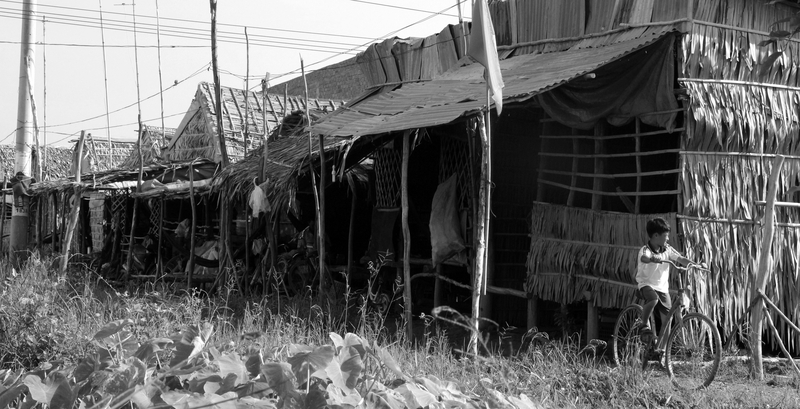 Sitting in his neighbor Oi’s hut in Hung Ha Commune, Phat was in tears as he pointed at the only light bulb in the hut, saying that his community has to ask a local to register for electricity usage. "Even for this light, we had to beg from others." Even as they are locked in this grim, daily struggle for survival, the undocumented immigrants wonder if they would ever get Vietnamese citizenship. 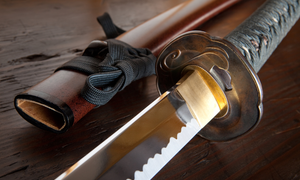 In resigned acceptance, Oi says: "Maybe I will not get it until I die."